Oh my god, so juicy! A burger you can't get enough of. Try our awesome spicy Jalapeño cheddar burger, deliciously good! WASH the lettuce and tear them into large chunks. Also wash the tomatoes and cut them into slices. Set the lettuce and tomatoes aside. REMOVE the pepper seeds and cut 2 peppers in small pieces and the other one in rings. MIX the minced meat, the two fine Jalapeño peppers, onion powder, cayenne pepper, garlic powder and season with pepper and salt. DIVIDE the minced meat mixture in 4 equal parts and roll them into balls with your hands. PRESS downwards to create a burger, they will be quite thick. 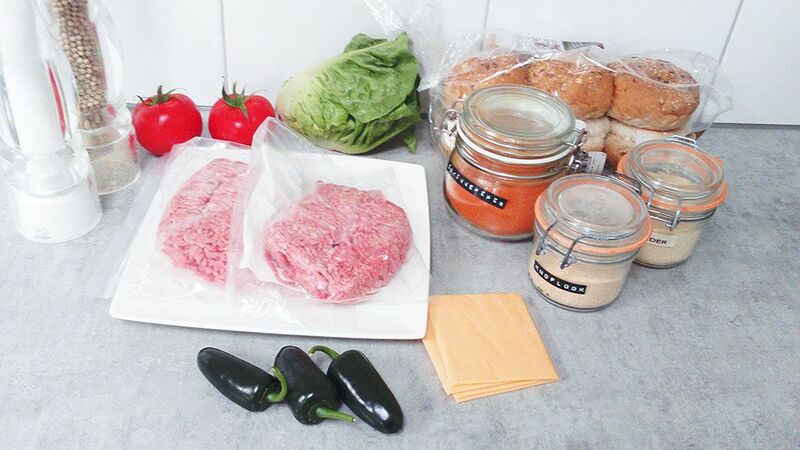 If you don’t like your burgers this huge, divide the meat mixture in 5 or 6 equal parts. If you’re going to melt the cheese in the oven, you should pre-heat the oven to about 180 degrees celsius or 350 degrees fahrenheit. But you can also put a lid on the pan and melt the cheese that way. 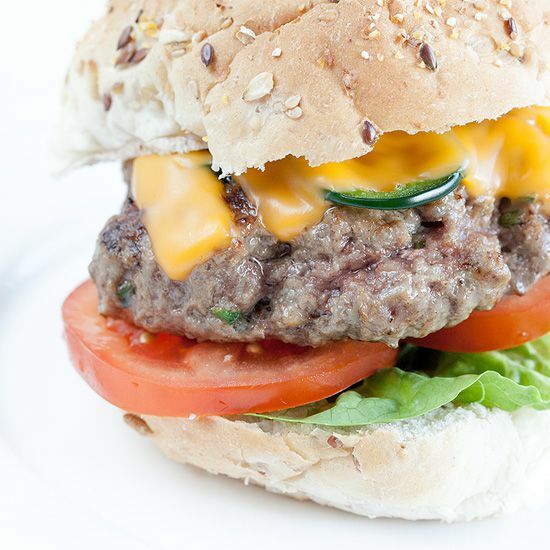 HEAT your grill pan and spread a little bit of olive oil on both sides of the burgers. GRILL the burgers about 3 minutes on both sides until the grill pattern is visible. 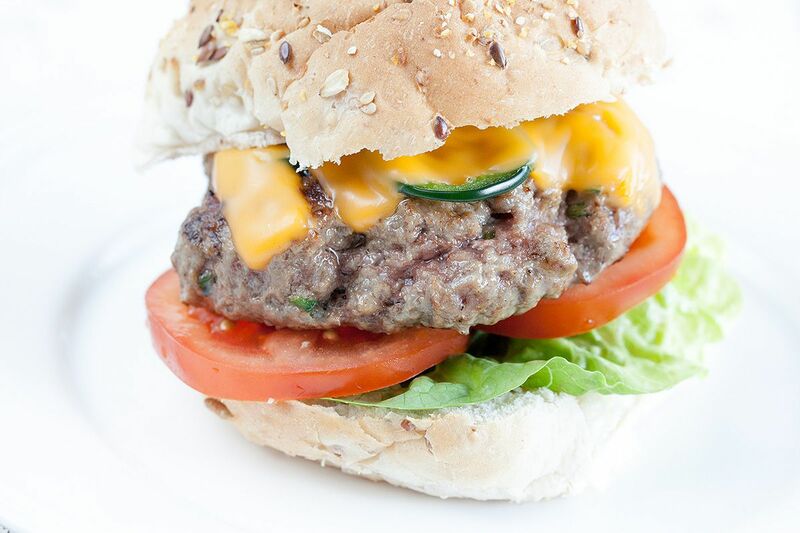 DIVIDE the Jalapeño pepper slices over the burgers and top it off with the cheddar cheese. PLACE the burgers in the oven for about 5 minutes, until the cheese has melted. Start with some pieces of lettuce on the bottom of the hamburger buns. Then some tomato slices, next is the awesome burger with Jalapeño peppers and cheese and place the other half of the bun on top. 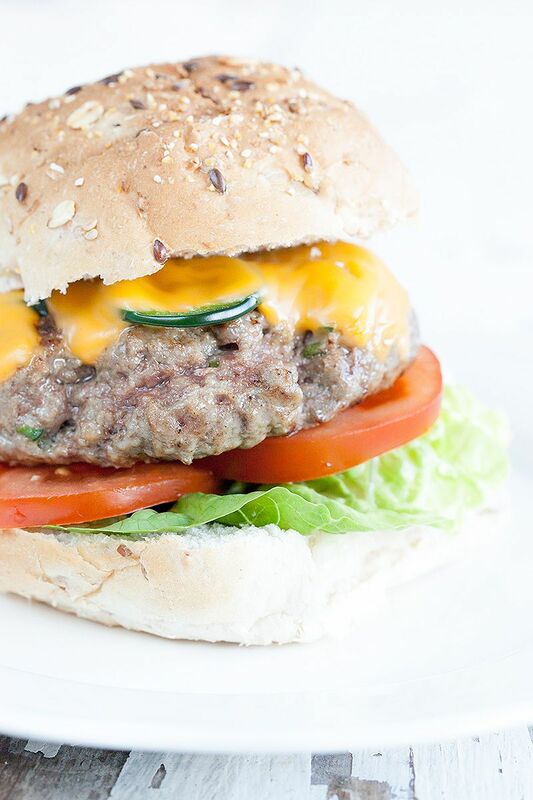 This burger is so juicy it doesn’t need any sauce or any other additions. Enjoy!